Glasgow City Council today announced that it will be removing all statues from George Square as part of an expensive landscaping project which is expected to cost the city up to £15 million. The historical monuments could be removed as early as next year in a rushed effort to make sure the work is carried out in time for the Commonwealth Games in Glasgow in 2014. The monuments to be removed – without public consultation – include works dedicated to famous Scots like the bard Robert Burns and inventor James Watt, as well as unique mounted monuments to Queen Victoria and Prince Albert. The square's centrepiece, the 80ft-high column featuring Scottish historical novelist Walter Scott (shown below), is also to be removed. Only the Cenotaph is expected to remain in place. It is believed that senior civic and business figures want to use the project as an opportunity to make Glasgow's premier civic space more amenable to hosting large-scale commercial events such as concerts, shows, fairs, exhibitions, promotional campaigns and sporting events. 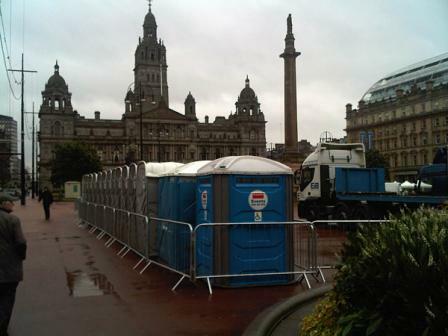 The photo below shows preparations in George Square for one such event, 'Run Glasgow', which took place earlier this month. Martin I think its a dreadful idea. So! they want to remove the monuments & replace them with Port-a-Potties, what a crappy idea..........pun intended. I agree with Isobel. These statues have significant historical value and should remain in George Square for tourists and residents alike to see and admire. What a loss that would be. It's so wonderful to see statues of poets and writers in George Square. I love seeing all of the flowers at the foot of the Robert Burns statue every January! Makes me wonder if there is any appreciation for the figures and what they achieved.They are a constant reminder of what made Scotland great from Engineers to medicine, literature and of course Rabbie. There has been consultation going on in Aberdeen for months about changing the gardens and this was vetoed but it looks like the changing of George Square is a fait accompli. The question in my mind is how are they going to move them without damaging them and where are they going. The whole idea is crazy, like we needed another concert venue next to the SECC and the Clyde Auditorium. WTF is going on in Glasgow Council. Where did these crazy people get their minds from and why are they allowed to run a city I really hope there will be a petition to stop this as these statues are more important than any of our half witted council whom I doubt very much there will ever be any great statues erected for them... send petition to all persons on your lists and then send it to all social network sites in order to send to this crazy council and stop it before it gets to uprooting our memories and rights to presenting our visitors and residents of a great city...and remember that there are travellers from all over the world with families and friends who come specifically for the purpose of photographing these statues. Yet another little bit less of a City of Culture. It would be national news and the subject of national debate if the City of London Council announced this sort of plan for Trafalgar Square.  Make it easy to make a quick buck from commercial events and fairs and to hell with the heritage. While we're at it, why not tarmac over Glasgow Green and pebbledash Provand's Lordship. These are part of our history and George Square would never be the same. I am just gobsmacked at this. In total agreement with Jupiter. If we remove the statues George Square will be just a run of the mill park found in any city anywhere in the world. George Square is one of a kind please don't let them destroy it. Dreadful idea....who had hair brained scheme! Leave them there! How disgusting is this. I know I don't currently live there anymore, but it is the city of my birth and the place where I grew up through my teen years. Who the hell are these people who sit in our elected councils and dream up this crap. It is time to start hanging people from lampposts and taking back our lives and our history. These people have no respect at all,l and deserve to be treated accordingly. Although i do not live in glasgow i used walk from bridgton to the square and admire that wonderful poet and bard rabbie to carried out this sacrilege is insult to the history and the people of scotland start a protition now and save our history. I can't believe this was even thought about.... How will they possibly remove the statues without damaging them. I was born in George Street my childhood memories are of playing on the lions in the square when I got older I appreciated the who and why the statues where there. I have lived overseas for many years when I come for a visit I always make for the square to sit and appreciate its beauty. Why oh Why would this be even considered.Shame on you Glasgow City Council.